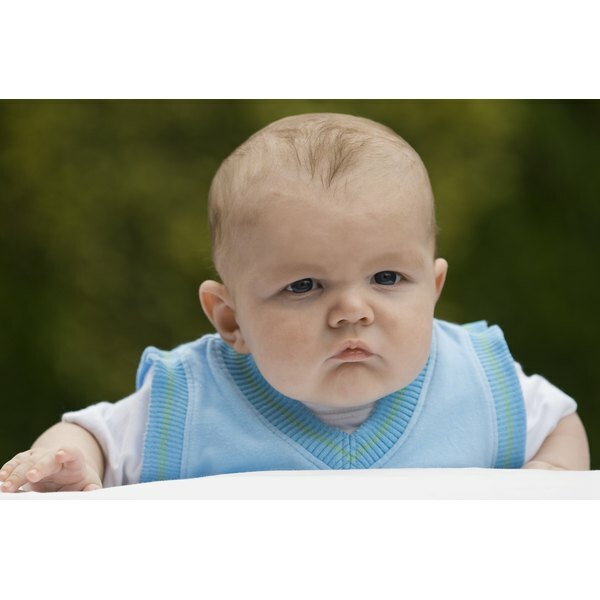 Babies are born with very limited vision, and they cannot focus directly on objects. It is quite normal for your newborn's eyes to move independently of each other, and they may even cross or wander outward from time to time, according to Prevent Blindness America. If these movements persist after 4 months of age, however, your baby could have a serious medical condition. Ask your pediatrician to examine your baby's eyes to determine if treatment is necessary. Your baby’s visual function will develop over the first 2 years of her life. Newborns don’t use their eyes much, but by 6 to 8 weeks of age, your baby should begin to follow the movement of objects with her eyes, according to experts at the University of Illinois. By 4 months, her eyes should be well-aligned and working in tandem. This allows her to develop three-dimensional vision. Ask your pediatrician to examine your baby’s alignment and visual fixation when she reaches 4 months of age. If your baby’s eyes do not align properly by the time he is 4 months of age, he may have strabismus. Approximately 2 percent of American children have this condition, which appears in several forms, according to Prevent Blindness America. One or both eyes may turn inward, outward, upward or downward. The misalignment may be intermittent or constant. Strabismus does not self-correct, and your baby needs medical attention to avoid more serious problems. Your pediatrician may prescribe glasses, medication or exercises to treat the condition. If your child's case is severe, surgery may be necessary. Ptosis is a developmental glitch in which the muscle that raises the upper eyelid is weak and causes the lid to droop. The lid sometimes covers as much as half the eye and may give the illusion that one eye is smaller than the other, according to University of Illinois specialists. The drooping lid can sometimes obstruct vision, and if the condition is severe, your baby may require surgery. Amblyopia, or “lazy eye,” is a condition that causes vision loss in an eye that appears healthy. The cause is usually an imbalance—such as strabismus, a cataract or a droopy eyelid--that makes vision in one eye better than the other, according to University of Illinois researchers. Your child will tend to use the stronger eye more and the weaker eye eventually will lose vision. Your doctor can treat this condition with special glasses, eye drops and/or a patch that your baby will wear over her stronger eye to force her to use the weaker one. Nystagmus is a condition in which your baby’s eyes move back and forth involuntarily, usually in a horizontal direction, but they can move diagonally or rotate, according to All About Vision. Typically, the eyes drift slowly in one direction, then suddenly shift back in the other direction. This condition may be caused by albinism, cataracts or incomplete development of the optic nerve. The degree of movement determines how much your baby’s vision is affected. If you notice such movements, contact your pediatrician immediately. You can help your baby develop his visual skills. The American Optometric Association recommends that you frequently change your baby’s crib position and his position in it to give him a different view of the world. Keep toys he can touch within 8 to 12 inches so he can practice focusing on them. Play games such as “patty cakes” in which you move your child’s hands around, or play hide and seek games with toys or with your own face.